Hope you’ve all had a good Xmas. Weather wise, it’s been dry and mild here, good for the dogs! Some people of course prefer a white Christmas and complain that they are now a thing of the past. But were cold Christmas’ s as common as we think? It is true that the warmest Christmas occurred in both 2015 and 2016, when daytime temperatures reached 13.1C. 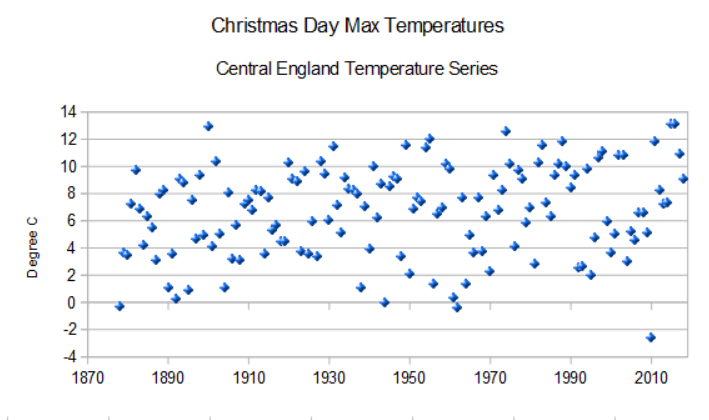 But the weather then was in reality little different to 1900, when Christmas Day hit 12.9C. Really cold days, when temperatures were below 2C, have been very rare since records began in 1878, only occurring on 12 occasions. Temperatures only stayed below freezing on 4 occasions, 1878, 1944, 1962 and 2010, the latter being the coldest day of all.